Robert “Bob” James Husson passed away January 24, 2019. Bob was born in Toronto, Canada on July 24, 1946, the son of William Husson and Theresa Clarke. He was a loving husband to Marlene Smith for 48 years. He moved to Colorado at age 6. He loved farming, horses, bicycling, family, fishing, travel, exploration, sailing, hiking, hockey, skiing, chocolate and wine. Bob was a true family man that absolutely loved being with his beautiful wife Marlene, 3 children, Jeffry, Jenna and her spouse Andy, Loren and his spouse Meghan, and his adoring grandchildren Brendan, Ashlyn, Connor, and Evelyn. He loved his family trips to Estes Park as well as his world travels with Marlene. Bob and Marlene traveled all over the world to wonderful destinations like Italy, France, Spain, Ireland, Canada, Mexico, Hawaii, and Panama. His travels also included sailing around Fiji and surrounding islands. Bob was a true handy man that loved to tinker and could fix anything! He enjoyed gardening and could grow the best tomatoes and corn anywhere. 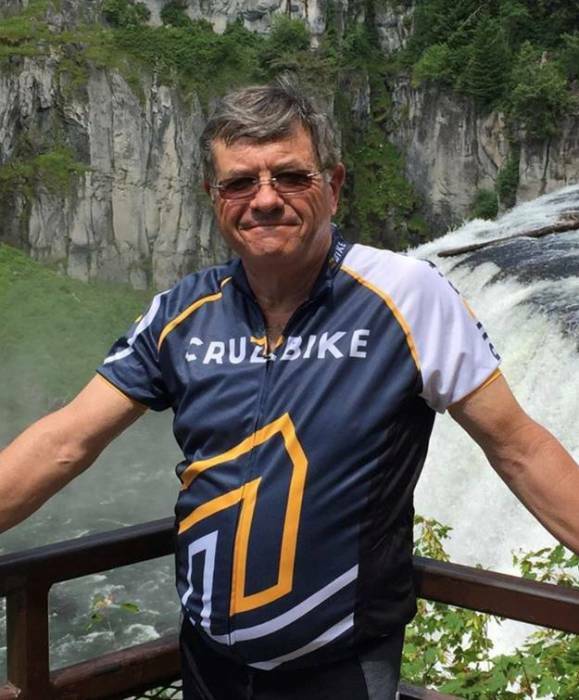 He was an avid bicyclist that rode all over America enjoying the incredible sights our country has to offer. He especially enjoyed cycling throughout our beautiful state with good friends. He enjoyed a good bite of chocolate, especially Kit-Kats, and could always tell you about the glass of wine you were enjoying together. He was a true wine connoisseur and enjoyed traveling to wineries and vineyards all over the world. Bob could always recommend the perfect bottle of wine to pair with any meal. Bob was a long time resident of Parker, CO where he was an active community member. He was very active in the Douglas County Democrats. He loved politics, he worked hard to change Douglas County for the better. He volunteered at the beer tent for Parker Days, was an active member of the Parker Breakfast Club, and was always advocating for what was right. Robert loved talking to people and always made everyone feel comfortable and a part of the family. Everywhere Bob went he saw familiar faces and enjoyed a good conversation. Bob was involved in many different kinds of work as his passions took him on many different paths. His professional career lead to positions such as a Lobbyist, Director of the Department of Labor of Colorado, Vice President of the Colorado Compensation Insurance Authority, Principle of the PIP IME program, and Governor appointed Public Trustee of Douglas County. After retiring Bob did not slow down! He was the President of the Pinery HOA, he was very involved with the Douglas County Democrats, and dedicated to his family. Bob loved his family and was a very proud dad and Papa. He was there to support his kids events all throughout their growing up and did the same for his grandchildren. He was seen cheering at band competitions, swim meets, soccer games, concerts, and all kinds of other school events. He was so proud of his children and grandchildren. He was full of love for his beautiful wife Marlene. We will be celebrating his life on Friday, February 15th, at 6pm in the PACE Center, 20000 Pikes Peak Avenue in Parker, CO. Please join us there to regale stories and have fun celebrating who Bob was and what he meant to us all.